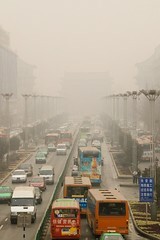 During our trip to China in December Corrie and I definitely felt the effects of the poor air quality. This has also been the discussion for over a year leading up to the Beijing Olympics that start tomorrow. China has been trying a variety of mechanisms to cut down on pollution including removing all cars from the roads for 2 weeks and seeding rain clouds to pull the particulates out of the air. The Olympics are finally here and the question still remains about the air quality and it's effect on the athletes. One even wonders what the availability of this data is on the ground there. So to help out, I built a Mapufacture map that pulls the daily data reports from the Beijing Municipal Environmental Protection Bureau. You can also get the GeoRSS and KML. As part of the new partnership we're looking at the combination of geospatial data with dynamic information and brought in the Olympic venues as additional map layer. Thanks to Corrie for the environmental analysis. View the Beijing Air Quality during the Olympics map.